JuMP Company's strict purpose is to promote theatrical education by involving youth in the performing arts and granting charitable scholarships to members seeking higher education. 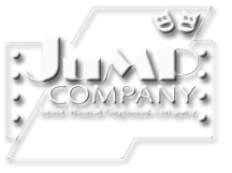 Although JuMP Company is a non-profit organization, everyone involved in JuMP profits from theatre education. Getting Involved: JuMP Company members must be in 2nd through 12th grades. Auditions are held in early January for the Winter Show and late Spring for the Summer show. JuMP Company holds several workshops throughout the year which are open to all school-age participants. Each show has a production fee which must be paid before cast members begin rehearsals. Typically this runs between $100-125. Need based scholarships for production fees are available with board approval, prior to auditions. Contact us for more information. JuMP Co is run by a board of volunteers and parent involvement is crucial to run a production. Information about upcoming, shows, workshops and auditions will be posted here as it becomes available.